What if I want to keep contacts in a flow until they've completed it? When a contact sends a message that matches a keyword you've set to start a flow, they'll automatically be placed inside it by default. This means that if a contact has been placed inside flow A and has responded with a message that contains a keyword that starts flow B, they'll leave flow A for flow B. This is useful in situations where you want to allow your contacts to move between flows at will using keywords. 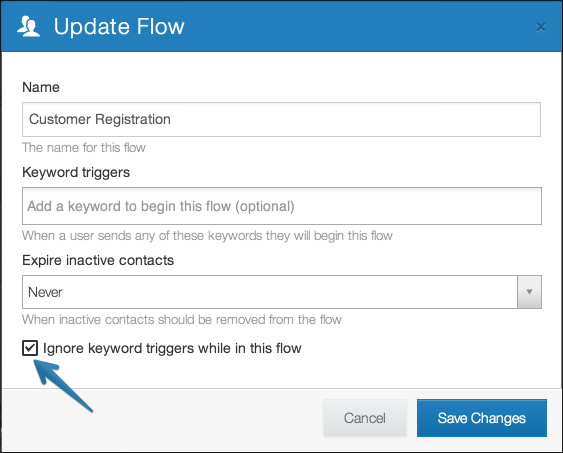 If you want to keep your contacts in a flow until they've either completed it or expired from it, you can configure it to ignore keyword triggers until your contacts' have left it. Navigate to the "flows" tab and click the flow you'd like to modify. 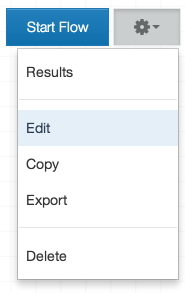 2. click on the gear icon in the top right corner of the flow editor, then click the "Edit" option. 3. Click the "Ignore keyword triggers while in this flow" box. 4. Click the "Save Changes" box to complete your flow edit.